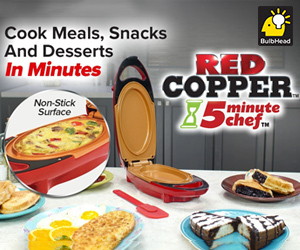 Give your Thanksgiving host something other than wine this year that will last long after the holidays are over. The limited-edition Demeter Fragrance fall inspired diffuser scents, now in a three-piece set of Cranberry, Pumpkin Pie, Mulled Cider. 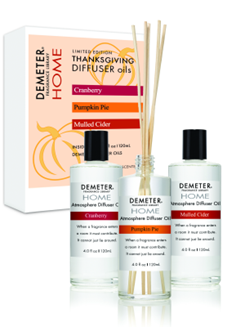 Demeter Thanksgiving Reed Diffuser Set consists of 3 full-size, 4 oz Diffuser Oils in classic Thanksgiving scents will enhance any atmosphere for months to come. Demeter Diffuser Oils constantly and subtly scent an 8 x 10 space for 2 – 4 months, and use the same great oils as in in our Colognes and other products. Just place the natural reeds included in the set in the glass bottle to draw the essential oils into the air, scenting your space with delicious aromas. All Demeter Oils are also available in 1oz cologne sprays. Demeter Thanksgiving Reed Diffuser Set is available for a limited time on DemeterFragrance.com for suggested retail price of $45 ($75 retail value). The limited edition Thanksgiving set will be available throughout November 2017. Demeter’s Cranberry is the scent of the freshest ripe berries, unsweetened, tart and full of citrus. Just like a storybook New England Fall moment with memories of the cranberry bogs of Massachusetts. A wonderful scent! What Thanksgiving would be complete without Pumpkin Pie? The memories of the laughter in the air and the smell coming from the kitchen dominates; pumpkin, sugar, cinnamon, a touch of ginger and hint of cloves. This scent is my favorite! Inviting and warm, Demeter’s Mulled Cider is a delightful scent anytime, anywhere. Simply delicious, brimming with the scent of sweet apples, mulled fruits, and spice. This set is perfect for this time of year and is definitely a holiday gift that everyone can appreciate! This year, stuff their stocking with beautiful skin care products! Bloom Mineral Beauty provides the finest skin care and beauty products utilizing exclusive Dead Sea minerals. The Dead Sea is well known for its therapeutic properties. For centuries, people have traveled from all over the world to its shores to soak in its salty, majestic waters (even I've been there and floated in the waters!). Research into general Dead Sea benefits and the minerals found in Dead Sea Salt and Dead Sea Mud has shown a 40% reduction in the depth of wrinkling. The minerals also moisturize, detoxify, and soften the skin. Bloom's Shielding Body Lotion is a luxurious lightweight body moisturizer enriched with Soy, Aloe Vera, Dead Sea Minerals and Glycerin to hydrate and create an all day protective moisture barrier. Bloom's Shielding Foot Cream is a non-greasy, deeply moisturizing foot cream enriched with Dead Sea Minerals, Calendula, and Aloe Vera to deliver smooth, hydrated skin. Bloom Mineral Beauty uses the highest quality ingredients available through science and nature. 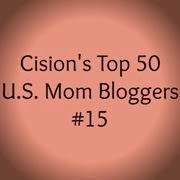 Their products are formulated to be mineral rich and are Paraben-Free, Petroleum-Free, and GMO-Free. I love the way it easily smooths onto my skin and leaves it feeling silky soft all day. Cold weather is brutal on my skin and Bloom Mineral Beauty gives me a great barrier against dryness. These two are excellent products! 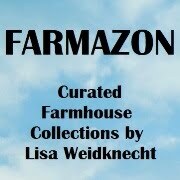 There's a great sale going on now! If you're looking for something really unique to give as a Christmas gift this year, I've found it! These custom intertwined double (or even triple!) rings from Nelle and Lizzy are perfect gifts for moms, grandmothers, aunts, and sisters. They will stamp a name, word, or date on each ring for you, so it's a truly personalized gift and a keepsake item that will always be meaningful. I got my Intertwined Rings with my grandsons' names on them, so they'll always be wrapped around my finger. The beautiful sterling silver rings can be stamped using either the Nelle font or the Lizzy font. Their signature lavender and rose bud packaging is available at checkout and gives the gift such a nice touch. 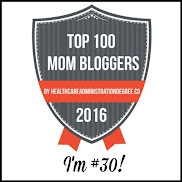 It's a perfect holiday gift idea, new mom gift, and bridal gift. Whose names will you have stamped on yours? Intertwined Rings for someone special. Mooshu Trainers - More Fun Than Any Other Toddler Shoes! Oh, the joy of finding out your new shoes squeak! My two year old grandson absolutely loves them and told me, "I a squeak toy now!" These adorable toddler kicks have so much style and each pair features removable squeakers in the heel to encourage tots to walk heel to toe. Be sure to give them room to run because they are going to love getting outside in Mooshu Trainers! Your little ones can step into Christmas in style this year with adorable Mooshu Trainers for boys and girls. The perfect present for under the tree, Mooshu Trainers are well-designed shoes with flexible soles and soft materials that bend with each step. Cute, comfy, and fun, these stylish shoes are gentle on growing feet and encourage a proper heel to toe gait. This pair is the Sawyer Boat boys toddler squeaky shoes in chocolate. They look great with all his slacks and jeans, and with the quality of materials I know they will last into next summer with ease so he can wear them with shorts. Mooshu Trainers come in tons of styles, like boots, loafers, sandals, and more. Plus, every girls' shoe that has a bow is also removable and can double as a hair clip. The velcro strap means my grandson can put on his own shoes and take them off all by himself. So far, he hasn't been willing to take them off. As a bonus, he's easier to keep track of when he's wearing shoes that squeak. I'm incredibly impressed with the quality of these shoes and my grandson gives his stamp of approval too. Dress up your little darling in shoes that even Santa would envy! A great stocking stuffer for any toddler’s first holiday, Mooshu Trainers will delight parents and kids this Christmas. Go check out all their great styles for boys and girls at www.mooshutrainers.com. Check out these cute Mooshu Trainers in action! Wild Zoo Train is such a fun read-aloud book for children! Written by Carmela LaVigna Coyle, the story is filled with fun sounds like the clickety-clack of the wheels on the track and the ding-ding-ding of the bell on the roof. Illustrated by Steve Gray, these darling pictures draw children into the tale of the train that journeys through the wilderness. Along the way, children learn names of the animals they see in their natural habitats. On this Wild Zoo Train ride, kids travel from the canyons to the jungles, and even the arctic pole. These stops aren't anywhere on the zoo map, but the conductor of the train knows the way. It's a great picture book that kids will love and it's a beautiful hardbound book you'll love to have in your kids' library. 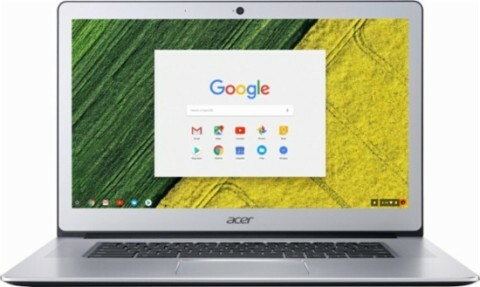 The Acer 15 Touch-Screen Chromebook is phenomenal! It has a stunning 15.6-inch display, 27 percent larger than 13.3-inch Chromebooks on the market. The larger size increases productivity by providing a more comfortable way to view multiple tabs and apps. 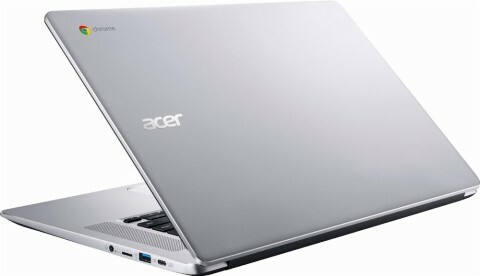 Acer continues to be the only Chromebook provider in the industry with a model with a 15.6-inch display. 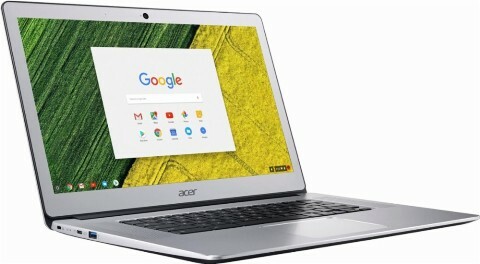 The Acer Chromebook 15 CB515-1HT-P39B model retails for $399 and has a 1920 x 1080 full HD display, Intel Pentium processor, 4GB of memory and 32GB of internal storage. 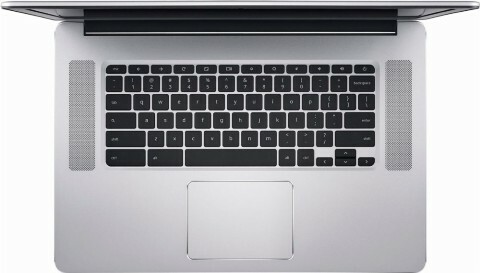 It is available at BestBuy.com and, as of this writing, is on sale for only $349. 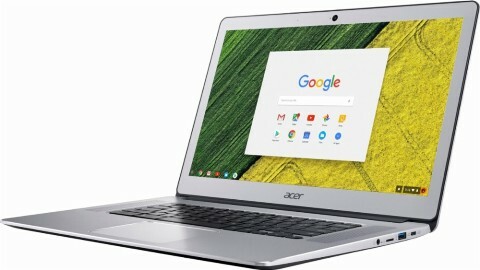 I've been testing out the Acer Chromebook 15 for about a week and, as someone who isn't technically inclined, this is the perfect choice for me. I love that it is ready to use right out of the box. I literally opened it, plugged it in, pressed the start button, logged into my Google account, and was ready to rock! I instantly had access to all my apps and the Acer Chromebook 15 even automatically loaded all my bookmarks from my previous laptop since I am a loyal Google Chrome browser user. Chrome OS is awesome! I love the endless apps available in the Google store too. Streaming videos and movies is seamless. It's very slim and lightweight, making it easy to take anywhere. 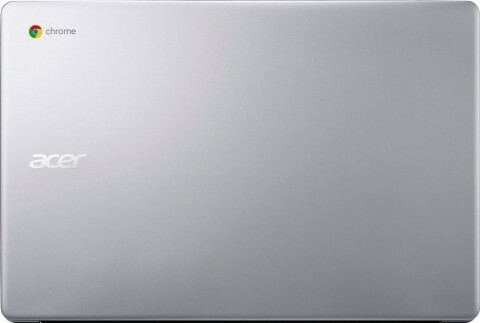 It's sleek, brushed aluminum casing is beautiful, professional, and modern. The anti-glare, wide-viewing-angle technology makes viewing a true pleasure with a big, clear picture. I easily get 12 hours of battery life from the Acer Chromebook 15 (my phone doesn't even get that). I love the touchscreen, but the big touch pad is easy to use, easily eliminating the need for a mouse. There are multiple USB ports, plus a headphone/microphone combo jack. The Acer Chromebook 15 is fast and powerful. 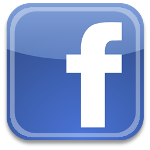 It’s ideal for sharing by multiple users, such as families, schools, or at different shifts at a business. Users can log into their own account to access Gmail, Docs, website bookmarks, and other information. Storage on Google Drive protects files, documents, and photos safely in the cloud, and ensures that the most current version of the file or document is always available and safe. I highly recommend the Acer Chromebook 15! at Best Buy and get it while it's on sale!